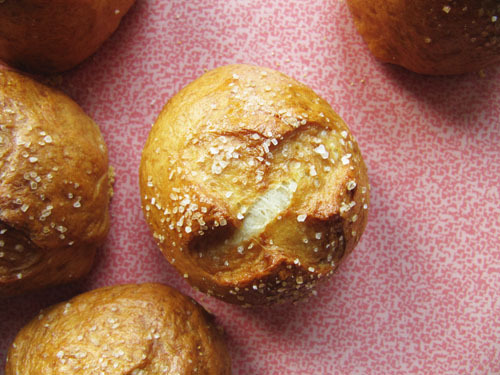 These pretzel rolls are like house guests that never over-stay their welcome. They’re gone too quick. You miss them already! You cross your fingers that they’ll just move into your spare room and sleep forever on the futon with mis-matched sheets, under the owl wind chimes, behind the computer desk, tripping over my yoga mat. They are the kind you walk to the grocery store for, despite the heat and shady characters, just to buy bread flour. Mostly, they’re so tasty that I wish I would’ve made double, and froze some for hoarding purposes. I ate veggie sandwiches on these at lunch. And when they were on the verge of stale, I toasted and topped them with goat cheese, lox, avocado, and pepper. These sea-salted dudes are good at life. Place the bread flour and salt in the bowl of your stand mixer,* lightly mix wit the dough hook. In a 2-cup measuring cup sprinkle the yeast and sugar over the warm water. Set aside until foamy, 5 minutes or so. With the mixer on, drizzle in the water mixture, and knead with the dough hook until a soft dough is formed. Transfer dough to a greased bowl, turning one to coat. Cover with a tea towel and set aside to rise until double in size, about 1 hour. 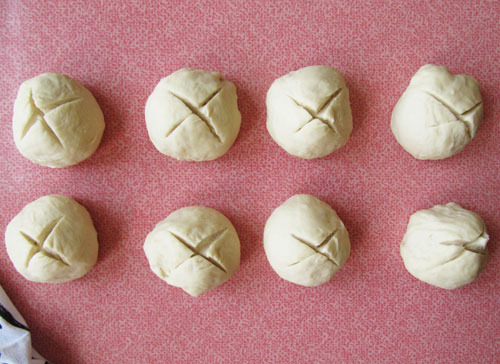 Punch dough down and divide into 8 equal pieces. Form into round buns and slash the tops with an ‘X’ using a serrated knife, cover with a towel and allow to rise for an additional 30 minutes, or until puffy and doubled in size, or until the water’s ready and boiling. Meanwhile bring a large pot of water to a boil and preheat your oven to 375°F. Grease a baking sheet and sprinkle with cornmeal. Add sugar and gradually add baking soda to the boiling water. Boil each roll for 30 seconds, then flip and cook for 30 more seconds. Place on the cornmeal covered baking sheet, brush with the egg white, and sprinkle with salt. Bake until brown, about 25 minutes. *You sure don’t have to use a stand mixer for these. Instead, simply whisk together the dry ingredients. Stir in the wet ingredients until it’s too difficult to stir. Knead on a lightly floured surface until the dough comes together. Proceed according to the directions above. i’ve had these bookmarked forever! 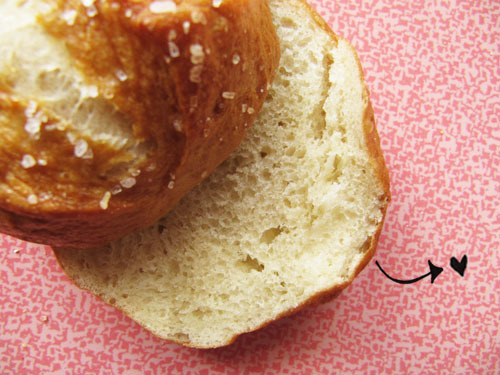 i need to make them…and i need bread flour. shady characters be warned! Ooh you should. They are worth the shady character scare! ha! when boiling these, how much water constitutes a “large pot of water”? Just wondering in case I want to double or triple the recipe. Thanks. Hey Lois! I just used a large stock pot filled about 3/4 of the way and I boiled about 3 at a time. So, you can use that same amount of water to boil all of them, no matter how many you have. I have wanted to make these.. and will.. soon! Are they super crunchy on the outside like a pretzel? They aren’t crunchy, but are more like soft pretzels. So they’re soft, but they totally taste like pretzels because of the boiling/baking/saltiness going on. I made soft pretzel dogs last week. Just like at the mall. They were a hit! Whoa Kerri, those sound amazing! Every summer I crave hot dogs, and now I’m craving pretzel dogs. Oh yum! I’m going to try these. I think I might try to fold some cheddar in there with them. 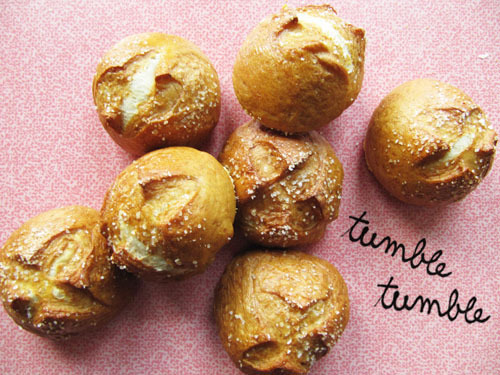 Cheese pretzel rolls! Whoa, Chris! Best idea ever. Let me know how they turn out! 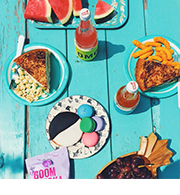 These look soo good, but unfortunately I’m a gluten free eater (by force, not by choice…). Any ideas on how to make these gluten free? Unfortunately I sure don’t know much about gluten free baking. I’ve looked around the web and I can’t seem to find a gluten free bread flour substitute. 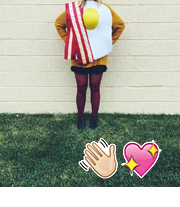 She’s a pro at all things gluten free! And makes tasty breads a lot. Oh my!!! These are amazing! My home is happy after taking these out of the oven.